Kawamoto Orchids is the best place if you looking for different or unique orchid species in Hawaii. 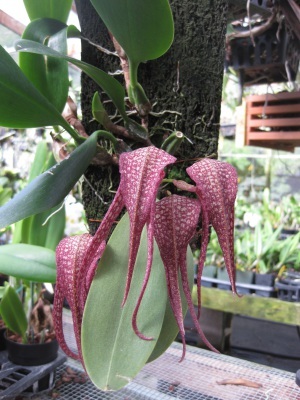 We currently have more than 300 different orchid species: Bulbophyllum Orchids, Dendrochilums, Phalaenopsis, Dendrobium, cattelya, and much more orchid species. Bulbophyllums are one of the easiest genera to grow and bloom when provided with the right environment. Most variety of this group require nearly the same conditions. 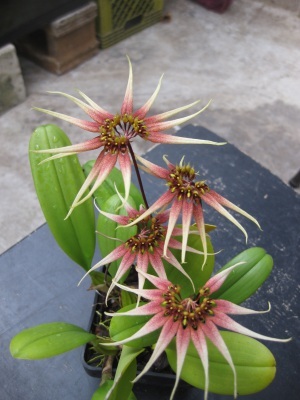 Many have very exotic dramatic and showy blooms. You can find some the wackiest and most bizarre blooms of this orchid family. Most bulbophyllums are easier to grow mounted which presents a more natural appearance or in baskets. This genus is one of the largest in the orchid family, numbering in excess of 3,000 species. This species have a very wide global distribution, with the heaviest concentrations in Africa and South-east Asia, but can also be found in South America. Most species tend to bloom intermittently throughout the year, usually with one or two major flushes. Usually bloom on the matured new growth. Fragrance varies greatly from one to the next, some being very pleasant, while others are downright gross and nasty. Flowers last varies from one to six weeks, depending on the species. Light: Most need moderate to bright light conditions or bright shade. If adjusted slowly, full morning sun up to noon is ideal by most bulbophyllums. Water: Bulbophyllums prefer to be kept moist, except a slight drying in the winter. During growth period, they should be given heavy watering, so they are never dry. Because of the wet conditions loved by this species, fungus can be a problem. A monthly preventive spray of your favorite fungicide is desirable to ward off pests or insects. Good air movement is a must to keep leaf fungus down because of the watering regime. Temperature: Warm temperatures above sixty to seventy degrees. Enjoys high humidity also. Most will not tolerate frost . Fertilizer: Very simple, they love to grind, 1/4 strength at each watering is sure to keep them elated. Media: Bulbophyllums are not deep rooters, so a very shallow pot is most ideal if not mounted. They will enjoy any loose well-drained media. 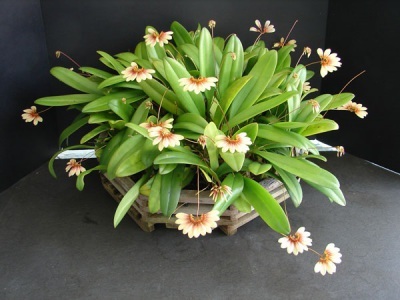 Repotting: Only some bulbophyllums grow in pots but many bulbo's are often cultivated in hanging baskets and still others prefer to be mounted on cork or tree fern. 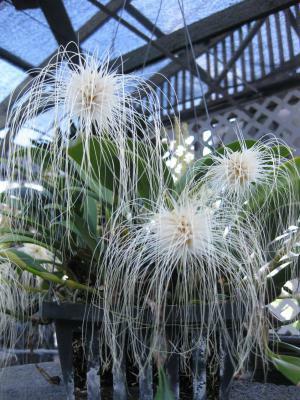 Since so many bulbophyllums are epiphytic, repotting never really comes into the picture. Overall, this is a worthwhile species to grow, and you will be so rewarded when you see those magnificent and showy blooms.